ISBNs are Here! Samples Sent! I am sending out finished samples (minus the ISBN numbers) to select individuals for review. Hopefully something catches on. Here we go. Huge News! One Step Closer! Just got my approval as an independent publisher for andychiangbooks.com! What does that mean? It means that I am now able to submit my books for ISBN numbers! One step closer to being a legitimate author! As a fun treat, I decided to make mini-stories that eventually turned into greeting cards. The one above shows a quick story about a Happy Tree and leads to a “nice” Happy Birthday to the recipient. Just something I’m trying out on the side. I was so ecstatic to see these books sitting on my coffee table today. Yet, at the same time, I was a little frightened of the journey that is yet to come. You might be wondering, but Andy, you already made your book, what’s next? The next step is to get the books in front of as many people as possible so that they can read through it and see where it might take me from there. Oh yeah… news on the trilogy… yes there is a third book in the works! For those that remember, the original title was “The Sunflower, The Peony, and The Casablanca.” After testing the name out with a few people, I found that the name was too long and it didn’t test well. As for the test reads, it seems that I will have to modify the story and the images… which means, those of you who are lucky enough to be in possession of version 1.0, will be holding a rare copy of the book. 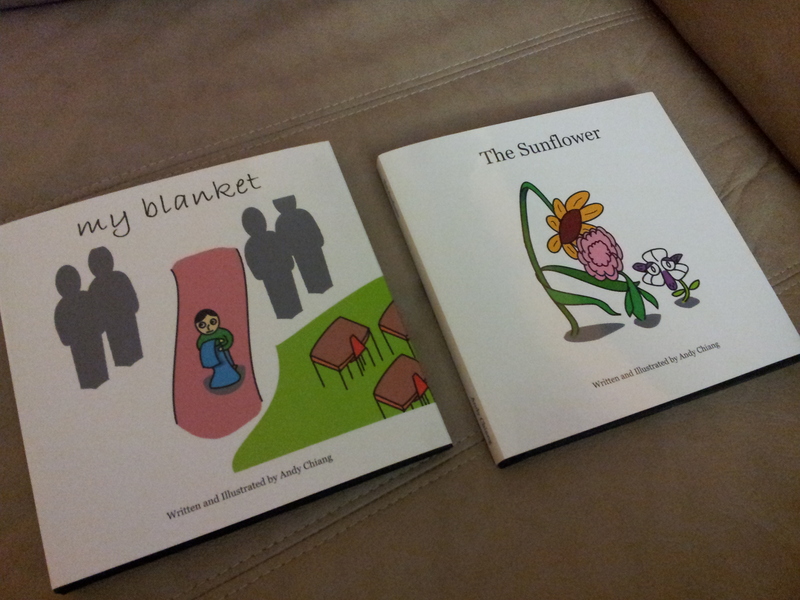 Check out the facebook page for some exclusive images from The Sunflower book. So after much deliberation, I’ve decided to show you the first images of The Sunflower, and a more comprehensive view of My Blanket. Don’t forget to like us on Facebook (link on the side) for exclusive content! Huge news, I’ve finally placed the order for the books – only a small quantity mind you (for myself and for samples) – and they are set to arrive on Nov. 19, 2013. It did cost me a pretty penny (after taxes, almost $32 a book), so I still need to find a better way to produce the books. For those wondering, I went through blurb.ca so that I can eventually sell my book on there as well. Now comes the next step, building up hype for the book so that people actually want it! I’m not sure how I’m going to do it yet, but many are suggesting kickstarter or just using the blurb bookstore. I know my methods aren’t the best as you’ve probably all been taught to plan first before you dive in. Well, take me as a learning example, as if I fail horribly, make sure you DO NOT follow anything that I’ve blogged.